Tripadvisor.com allows travelers to review where they stayed, dined, and what they got up to on their vacation. Check out this review a happy guest wrote about Jabberwocky Yacht Charters. "If you do nothing else in Antigua, you MUST do this!" "We had a fantastic time with Nick and Kaye on Jabberwocky. I was quite unsure about being on a yacht all day, especially with people I didn't know. IT WAS AMAZING!!!! Words do not describe how superb this trip was, watching turtles, having a chance to steer, swimming in a crystal bay, and an unbelievable lunch! The whole trip was amazing, and Nick and Kaye had a wealth of valuable information to share. They made us feel very relaxed immediately, even me who was petrified of being on a boat! 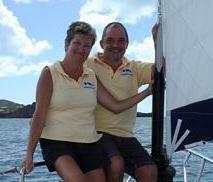 We were put at ease by this couple, who are very relaxed but experienced sailors. We took control of the wheel for a while each, and saw an amazing view of the beaches and bays that cannot be experienced unless you are on the water. This was a perfectly chilled out way to enjoy a day, it sure beat sitting on a very crowded, fast moving and drunken rowdy catamaran. I would recommend this to everyone, and it was the highlight of our honeymoon. This is a trip not to miss!!!! It included a free bar and lunch, and worked out about the same price for the pair of us to do, as any corner trip recommended by the rep. This is not spoken about enough. If you fancy something amazingly different to do, then this is it!!! Posted by User holfromhell from the UK. Click here to view this and more reviews of Jabberwocky Yacht Charters on tripadvisor.com.